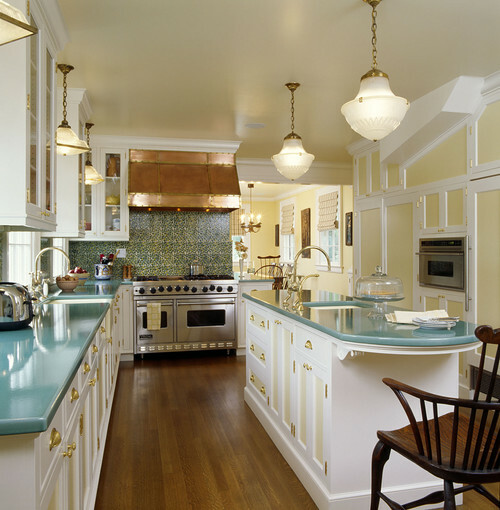 When I gave my Syracuse, NY kitchen a facelift in 1995 I turned to a marine supply catalogue to get the nickel cabinet hardware I envisioned for my historic 1926 Tudor Revival. Shiny brass was still the norm in kitchens and bathrooms back then, but I wanted something different, even if I had to be super creative about sourcing it in the days before online shopping. Now, nearly 20 years later I have had my fill of nickel, stainless, and chrome. While shopping at Homegoods in Falmouth, Mass on Cape Cod recently, I saw a display of antiqued brass table lamps and I fell in love. Not since the 1970s have we seen burnished brass. It's time to give this overdue classic a modern twist and bring it into our homes. 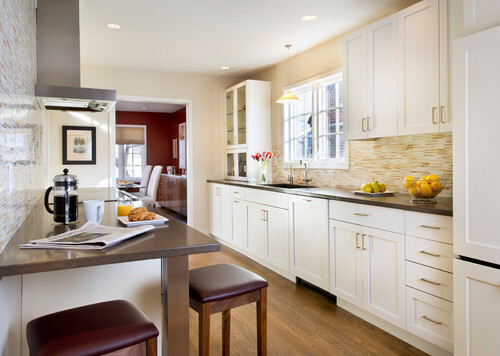 The white cabinetry, end-grain block countertop and industrial light fixtures look familiar but check out the hardware! These are not your grandmother's brass pulls. They are simple and modern. 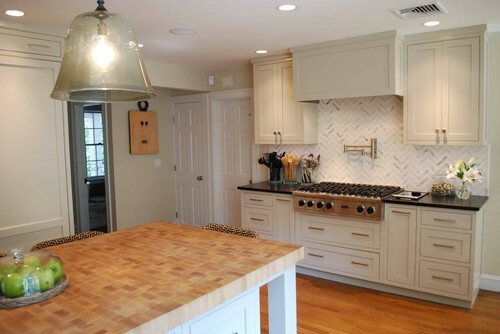 This is another example of classic brushed brass with a modern sensibility. 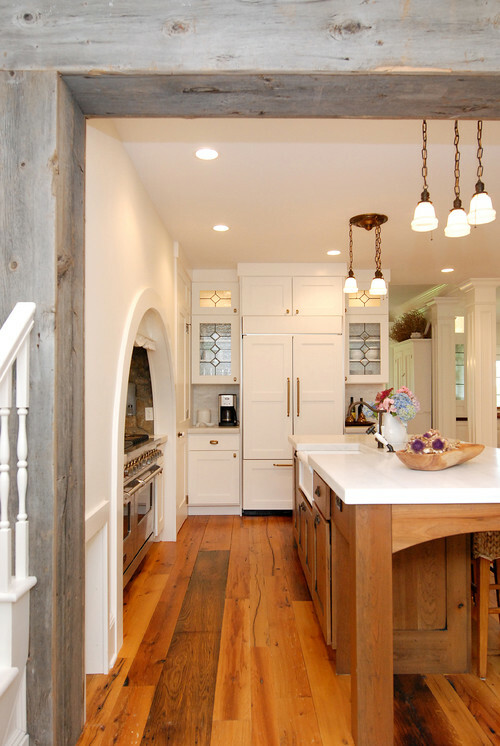 The burnished brass metal of the hanging pendants repeats the brass hardware. It is completely at home with the stainless stove. Here is shiny brass on bin pulls that until now were always in nickel. I think that's the key as we transition from silver to brass-- take the unfamiliar finish and put it on a familiar design. This is what makes it updated and fresh. 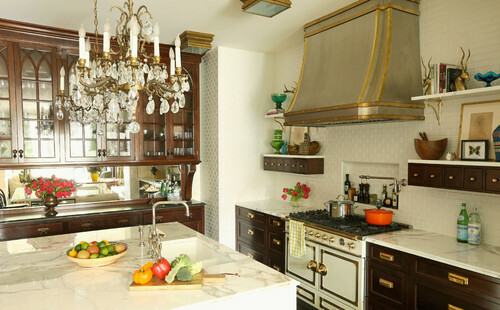 The Cornue range and hammered brass and stainless hood take command over this kitchen with a lot going on. 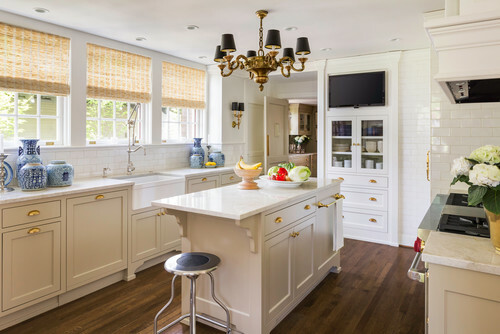 Between the glass-front cabinets in mahogany, the marble topped lower cabinets in white and two vintage crystal chandeliers, we might not think the stove wall could manage yet another cabinet finish with giant brass pulls, but the designer pulled it off. Once again, the bin pulls are common, the brass makes them new. It's the unexpected finish on the item we've seen for years that makes the new antiqued brass such a welcomed change.